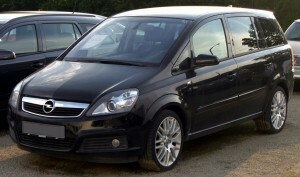 Driving a Vauxhall Zafira (05 onwards) is like holding onto a revolutionary icon. In 1999, the Zafira caused a huge stir as a compact, spacious, zippy car that outperformed other vehicles in its class. The 2005 range saw numerous improvements that left the competition trailing and, by 2006, the Zafira was the tenth most popular car in the UK’s domestic market. These days, most MPVs outperform the Zafira for versatility, and this once proud car is showing signs of wear and tear. There’s a lot of variety in the Zafira range but two models were the most popular. The 1.6 litre range employed 103bhp to reach top speeds of 109-155mph while the 1.8 litre range used 138bhp to hit top speeds of 122mph. The extra torque of the diesel engine models was well suited to a car designed to carry large families. Diesel trumped petrol when it came to the Zafira’s running costs. The 1.6 litre engine managed 42.0 mpg and CO2 emissions of 157g/km while the 1.8 litre offered 30.0mpg and emissions of 168g/km. The diesel versions returned 55.0mpg and CO2 emissions of 134g/km. As usual, age affects running costs dramatically, meaning older Zafiras are currently less economical than these specs suggest. Practical transportation was the raison d’etre of the Zafira range. However, while seating seven in comfort sounded great, it left very little boot space. If you left the kids at home, the middle and back seats folded flat to provide as much legroom or boot space as you needed. The higher spec Zafira managed to put storage boxes in the roof, which certainly helped. This is a big problem with Zafiras as they age. Thermostats have a nasty habit of malfunctioning and hose joins frequently rupture. Unfortunately, this tends to ruin the head gasket and many of the sensors. Clutches wear out fast in the Zafira range, with models as late as 2011 having ongoing issues. This is an expensive problem and you may be better off replacing or scrapping your MPV. If you’re planning a family road trip, you run the risk of your turbo stopping. This problem is frequently reported after long journeys. Even new Zafiras are beginning to wear out. Thankfully, scrap yards have a lot of use for the once popular Zafira. At the first sign of trouble, they’re the best people to call. If your Zafira is showing signs of wear and tear, contact Scrap Car Kings today.